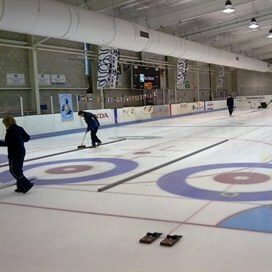 Dumfries Ice Bowl also have a cafe and bar for you to relax in and a large sports hall - which plays host to a different activities and clubs every week. There are a number of Development Schemes running at Dumfries Ice Bowl. Skate UK Scheme, the learn to skate programme you/your child will be able to pass through 10 levels, from Foundation to Participation. Ice Hockey learn to play scheme, through these beginner classes participants will have ther opportunity to join the Solway Sharks junior club. There is the Curling's Cool which is a Royal Caledonian Curling Club initiative which provides introductory sessions for primary school children, through which the basics and essentials of curling are taught. Finally there's the Snowtots, a Coach led activity session designed to introduce under 5's and parents to ice and ice sports through play. Parents/Guardians are encouraged to join in on the ice (either on skates or not) in order to foster a safe, friendly and interactive environment. Along with the Cafe and Bar serving meals, snacks and beverages, a mini conference area /meeting room, and a number of different Birthday Party Packages, the Dumfries Ice Bowl has a wide range of different facillities and activities on offer for you to take part in. Training for all ages and competition at national and international level. Coaching, team opportunities and development with training sessions on Tuesdays and Thursdays. The club train on Tuesday nights and play matches in the English North Division 1 League. The club play in the Moralee Conference of the National Ice Hockey League (North). Training takes place on a Sunday night. Learn and play ice hockey from 18 years old. Organising senior leagues, competitions and coaching. Coaching for young curlers aged 6 years and older.